Ban the bun and pass the potatoes! 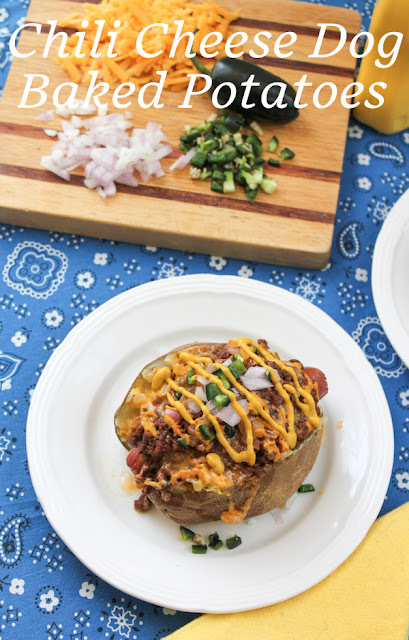 These chili cheese dog baked potatoes will be a favorite at your next family dinner or barbecue. After making a good pot of hearty spicy beef chili to serve over a chili cheese omelet a few weeks ago, I was looking for ways to make the leftovers into different meals. One night we had chili cheese dogs. Not being much of a bread person, I ate the first one in a hot dog bun and then had a second wienie straight on the plate with just the chili and toppings. The next day, with leftover chili still to eat, I considered my options. A bowl of chili with tortilla chips? Another chili cheese dog? And then it hit me. 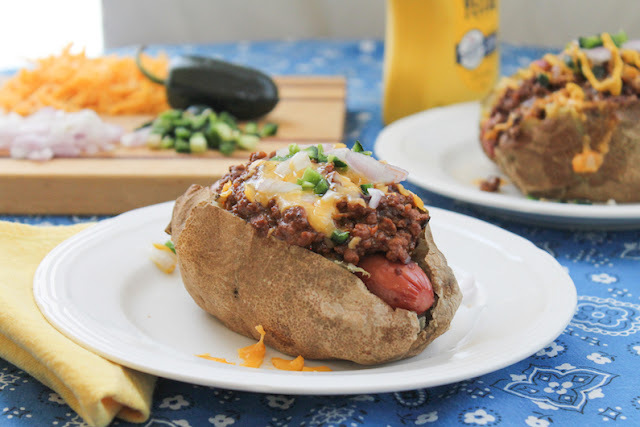 Chili Cheese Dog Baked Potatoes! 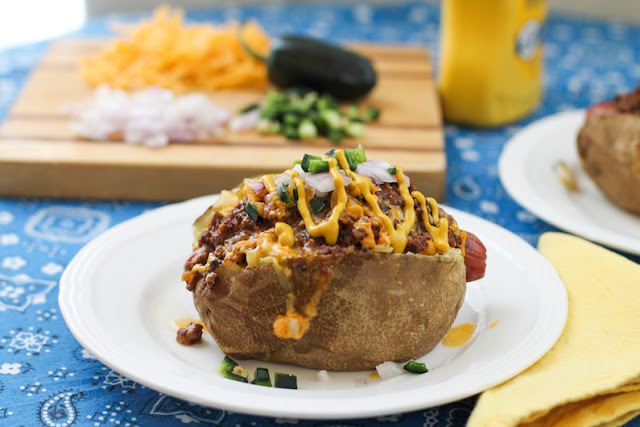 No buns, just lovely baked Russet potatoes with their toasted skins cut open and fluffy insides filled with all the good stuff a chili cheese dog would have. Genius, no? I may never eat a chili dog in a bun again. Scrub your potatoes clean and dry them thoroughly. Poke them several times with the tines of a fork. Rub the potatoes with the oil and place them on a baking pan. Or, if you have metal shish kabob skewers, you can put one through each potato and put them directly on the oven rack. Bake the potatoes for 45-50 minutes or until they are cooked through. Panfry or grill the wieners until they are golden on the outside and hot on the inside. Warm the chili as well. Once the potatoes are done, cut them open lengthwise and use a towel or oven mitts to push them open from the ends, to fluff up the insides. 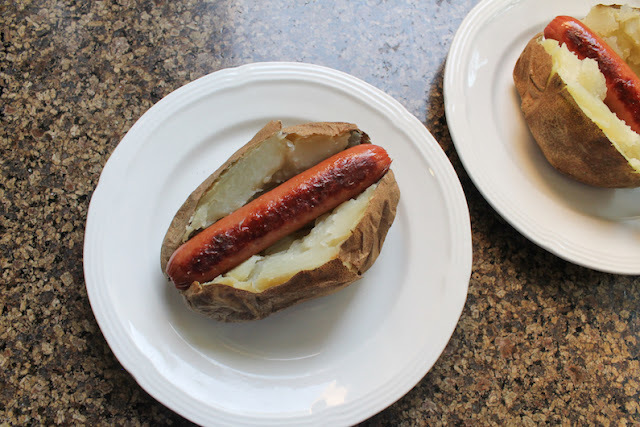 Add a wiener to each potato. Top each with half of the chili and then the cheese. 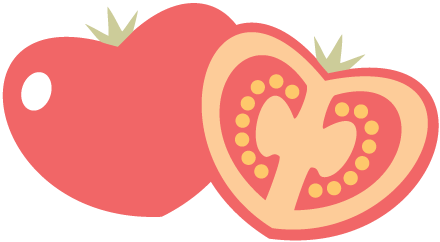 Garnish with additional ingredients, if desired. 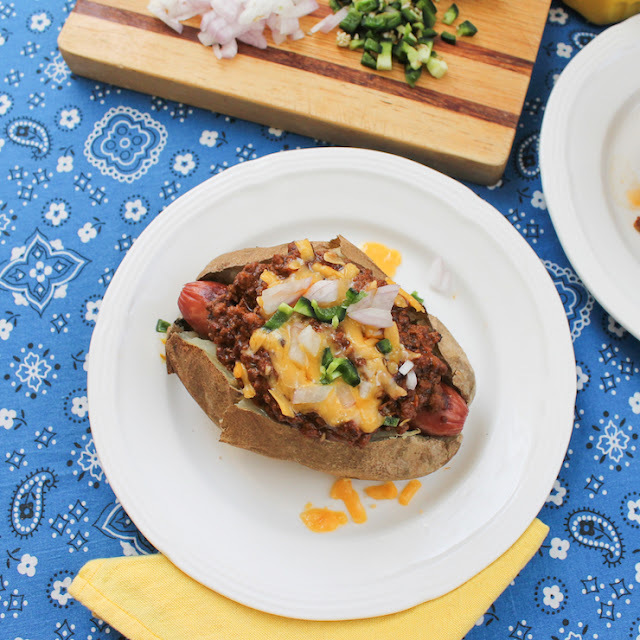 This week my Sunday Supper group is sharing creative hot dog recipes and I am hosting! 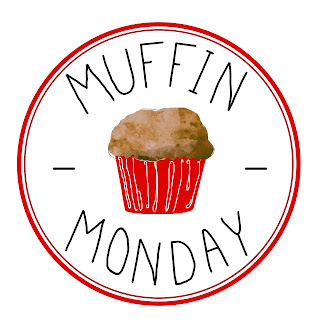 Please check out the fabulous recipe links below. 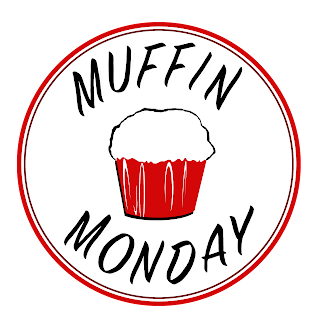 Many thanks our event manager, Cricket of Cricket's Confections and my co-host Mary Ellen from Recipes, Food and Cooking who will be handling the Twitter chat this evening. 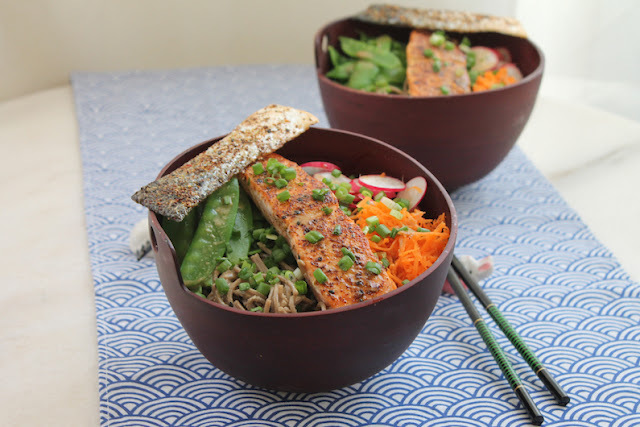 Pan-fried salmon soba noodle Buddha bowls with ginger sesame dressing are easy, tasty and healthy too. They can be made ahead of time and chilled, if you like cold salmon like we do, or assembled when you are ready to eat with warm salmon on top. Either way, you are going to love the flavors of this dish! Years ago my father was living in Southeast Asia. Every time I went to visit him, I flew on the Japanese national carrier, JAL. Their menu never seemed to vary, at least in Economy. You had the choice of a Western meal, invariably a small hockey puck-sized filet mignon steak, overcooked, grey and flavorless. Or the Japanese meal, a small bowl of delicately flavored miso soup with slivers of seaweed and cold soba noodles with a delightfully salty savory dipping sauce. There were other parts to the meal to accompany the noodles, but those were the highlight for me. A revelation of tender chewiness unlike any noodle I had met before. And their dipping sauce was heaven. I guess you know which meal I would choose. Ever since, I’ve been a fan of soba noodles. And, frankly, Japanese food in general. When was the last time you’ve ever heard that airplane food was a positive convincer for a whole country’s cuisine? I owe JAL a debt of gratitude. 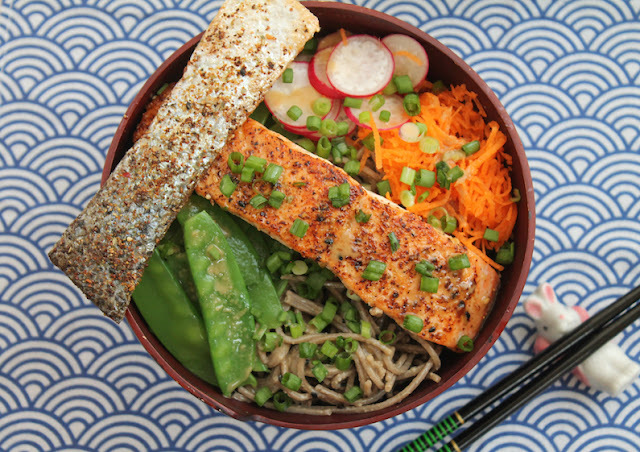 You might think the star of this recipe is the salmon, sitting there on center stage on top of the Buddha bowl. And it is lovely, especially seasoned with the shichimi togarashi. But I’ve got to tell you that what makes this dish special is the homemade ginger sesame dressing. 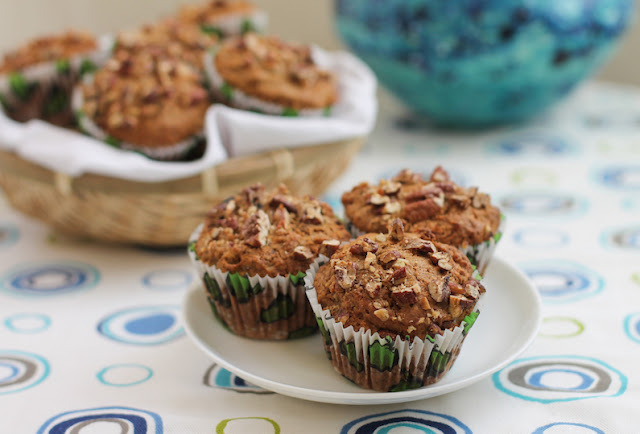 It’s so easy to make – and it keeps well in the refrigerator. It’s also what adds the most flavor to this cold soba noodle salad. 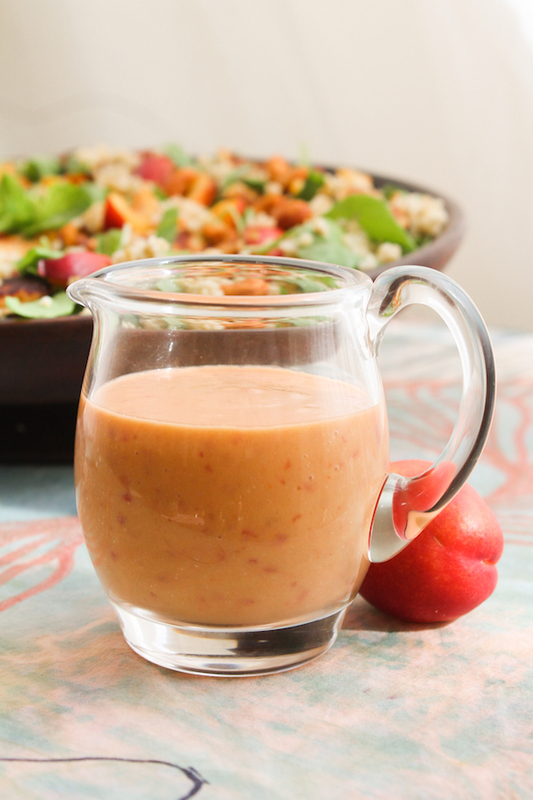 You’ll have ginger sesame dressing leftovers with this recipe so try it on a fresh baby spinach salad with oranges and maybe some toasted almonds. Another of our favorites. Shichimi togarashi – Read more about it here. 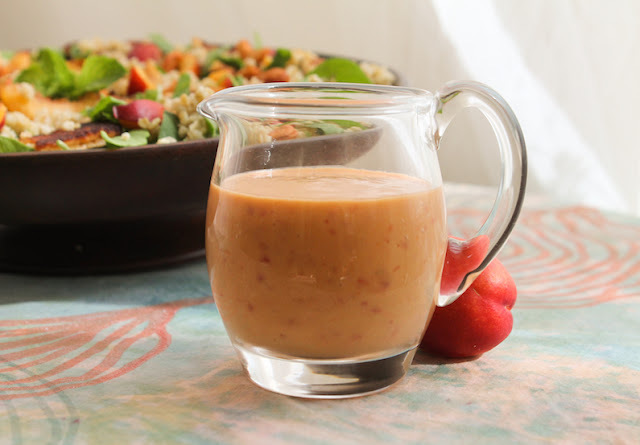 First, make the ginger sesame dressing: Combine all the ingredients in a blender or in an appropriate vessel with a hand blender. Process until smooth and emulsified. 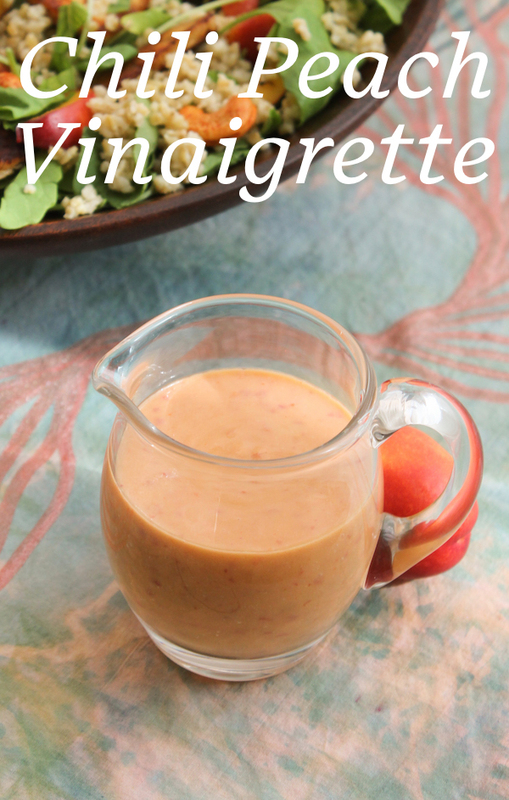 Refrigerate the dressing as you prepare the rest of the ingredients. It will keep well in the refrigerator for at least two weeks. Season the salmon fillets by sprinkling salt, black pepper and shichimi togarashi on both sides. Cook them skin side down in a hot pan just until you see the color lighten inside the skin. 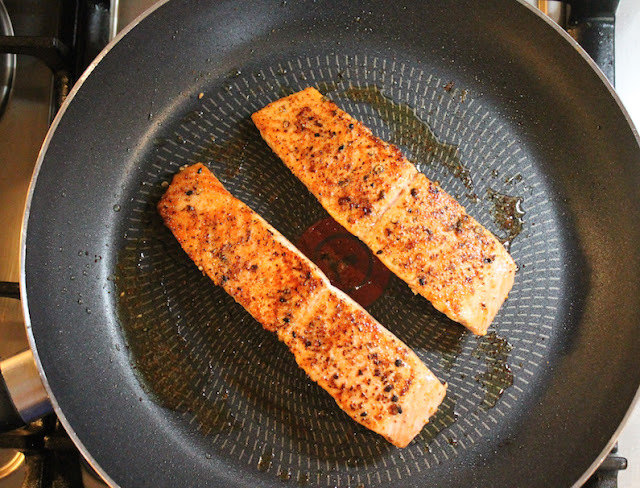 Remove the salmon from the pan and place on a plate skin side up. Use a thin blade to gently remove the skin and put it back in the pan. Cook till crispy. Set aside to drain on a paper towel. Meanwhile, put a large pot of water on the stove to boil. 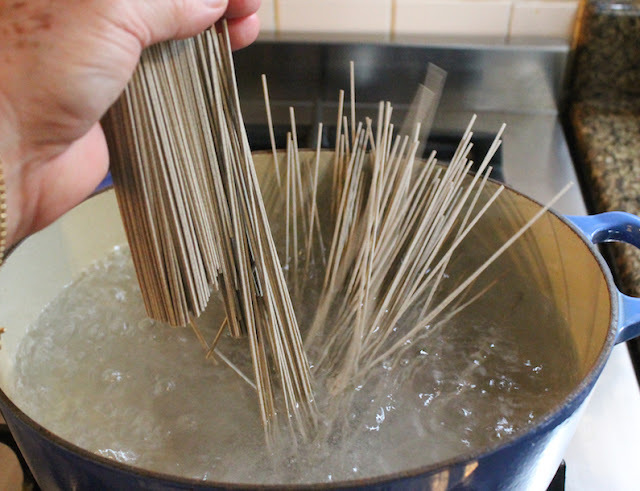 Once it comes to a boil, add in the soba noodles a few at a time and give them a bit of a stir so they don’t stick together. Bring water back up to a boil and then immediate reduce the heat to simmer. Cook for about 6-7 minutes for thin noodles, 7-8 minutes for thicker ones, or according to the package instructions. In the last 2 minutes of cooking time, add in the snow peas. Fill a large bowl with cold water and add some ice cubes. Drain the noodles and snow peas in a colander and rinse with cool water, washing them till the water runs clear. 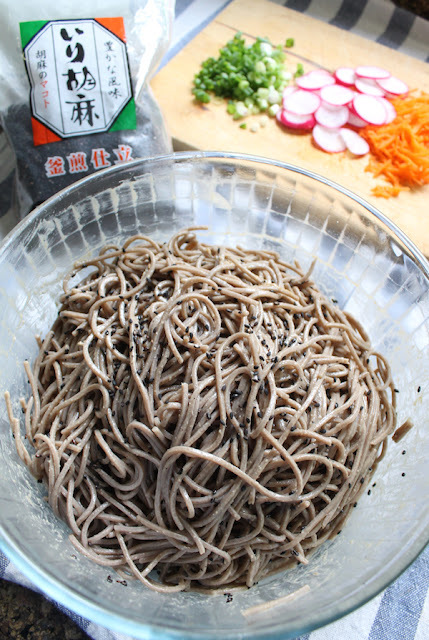 Soba noodles are quite starchy and washing them is essential so do not skip this step. Now put them in the ice water until completely chilled. Drain well in a colander until dry. 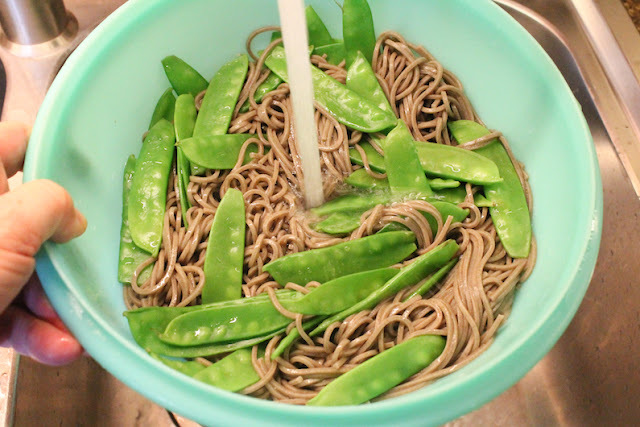 Pick the snow peas out of the chilled soba noodles and set aside. Pour the dressing over the noodles and toss them gently to coat. Add the sesame seeds and toss again to distribute them well. 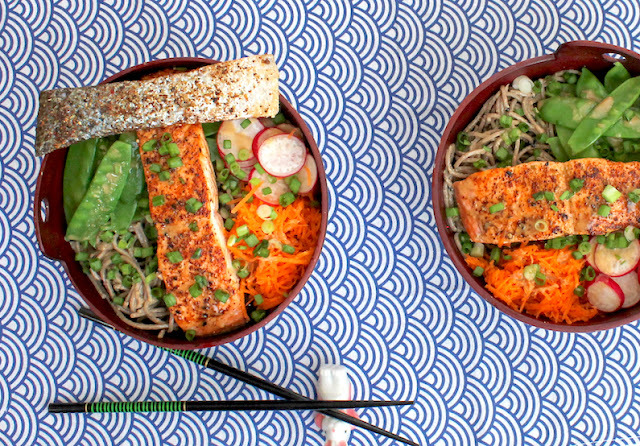 You can cover and refrigerate the noodles now and assemble your salmon soba noodle bowls later, if need be. To assemble the noodle bowls, start with the dressed noodles, then top with the snow peas, grated carrots and sliced radishes. Add in the salmon. Drizzle on a little more of the dressing and sprinkle the bowl with the green onions. Don’t forget to add the crispy salmon skin! 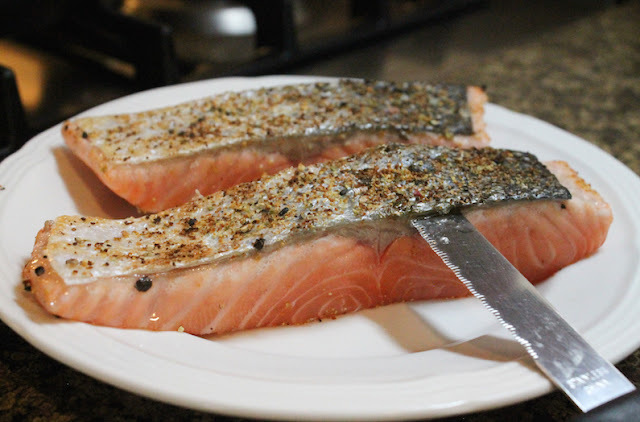 This is our favorite part anytime we cook salmon. 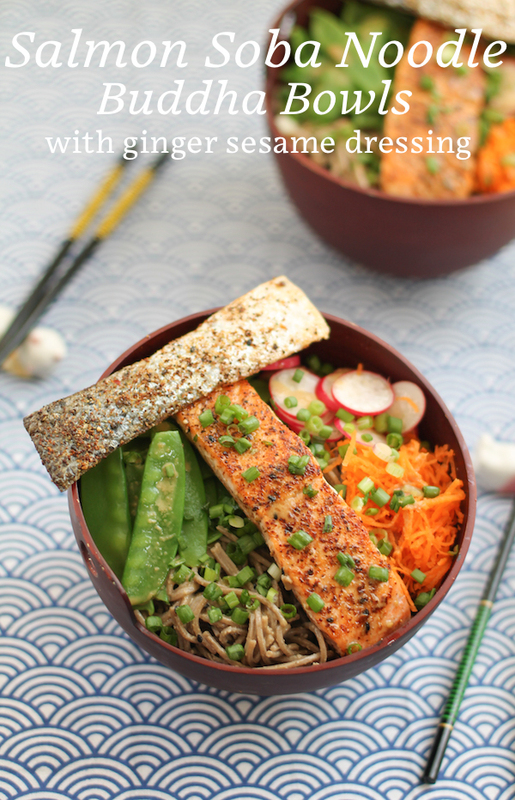 This month my Fish Friday Foodie group is sharing Buddha bowls for your dining pleasure. Fresh and healthy Buddha bowls are apparently all the rage right now, with their starches or grains, protein and fresh vegetables. Many thanks to our host Sue from Palatable Pastime for pushing me to make my very first Buddha bowl! Check out the other seafood Buddha bowls right here. 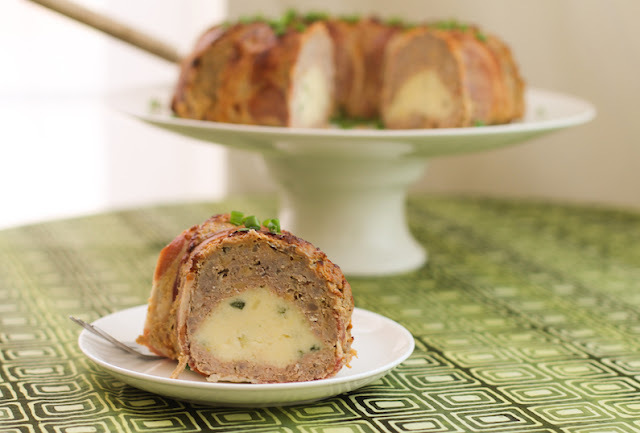 Elevate meatloaf to a whole new level with this chive potato filled cheeseburger meatloaf Bundt recipe. 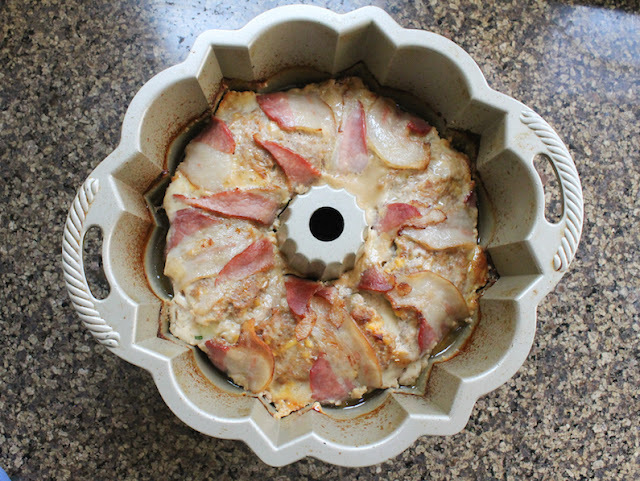 It is a delicious new family favorite and a beautiful centerpiece for your Sunday supper or buffet table. 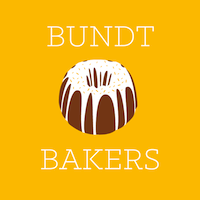 This month our Bundt Baker host is Colleen from Faith, Hope, Love and Luck Survive Despite a Whiskered Accomplice and she challenged us to use our Bundt pans to bake something untraditional. 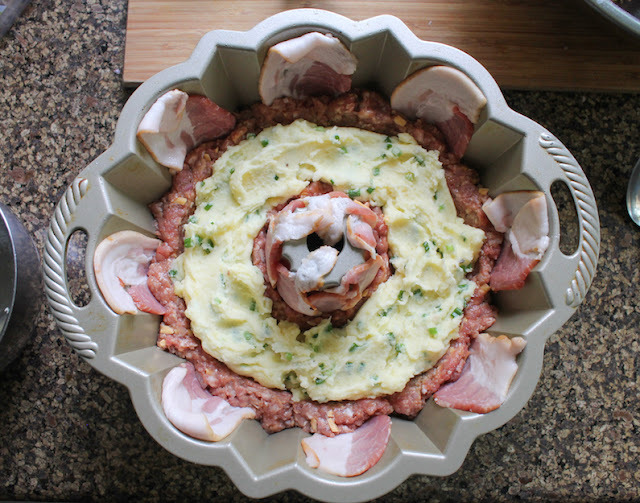 I briefly considered making a pork terrine - a pâté de Campagne of sorts – or a crustless quiche. But the honest truth is that I didn’t feel like eating either of those things. What I really felt like eating was meatloaf and mashed potatoes. 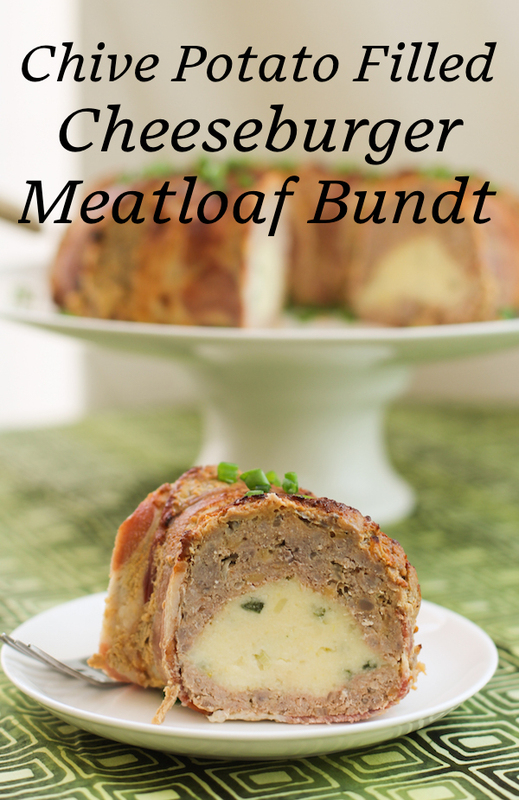 And so, this chive potato filled cheeseburger meatloaf Bundt was born! It was an absolute hit with my favorite taste-tester/husband. After enjoying the meatloaf for dinner the first night, he took meatloaf sandwiches to work for lunch for the next few days, declaring them fabulous. Peel and quarter the potatoes. Boil them till tender in lightly salted water. Drain the potatoes and mash them completely with a potato masher. 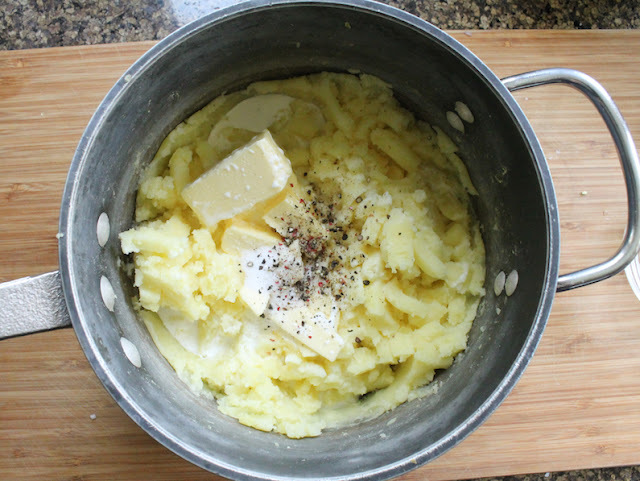 Stir in the butter and cream and season the mashed potatoes with salt and black pepper. Set aside to cool. 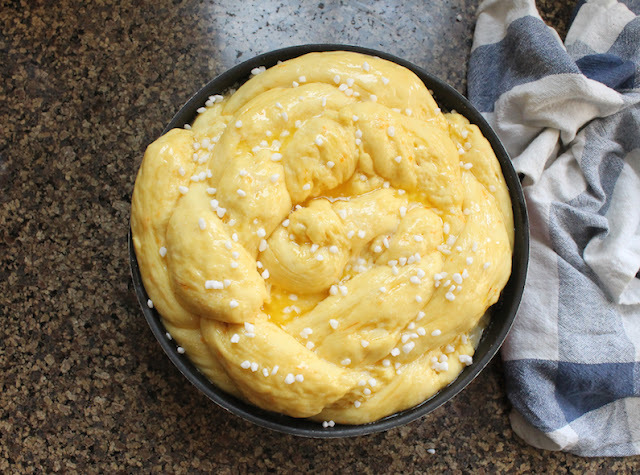 Preheat the 350°F or 180°C and brush the 12-cup Bundt pan with the canola oil. 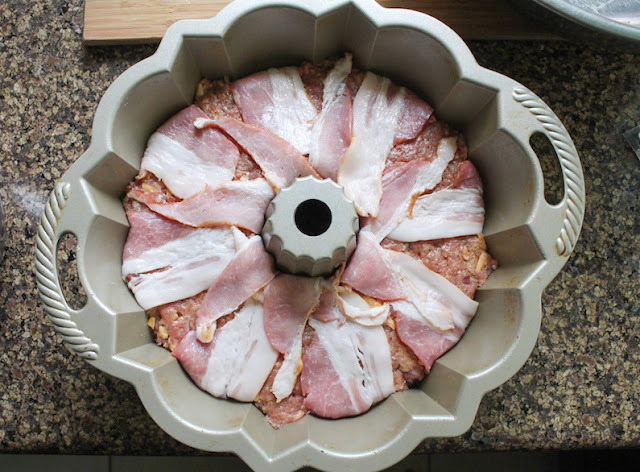 Line the pan with the bacon. Rip the bread into rough pieces and, in a large bowl, pour the milk over it, pushing the pieces down into the milk. Soak until all the milk is absorbed. 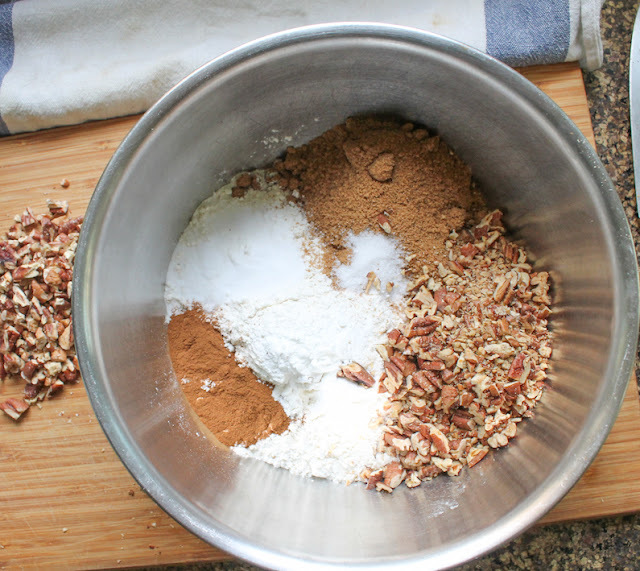 Add all of the other ingredients to the bowl and mix well. Carefully spoon two-thirds of the meat mixture into the prepared pan. Press it down and then use a spoon to create a channel in the middle. Add the green onion tops to the cooled mashed potatoes and mix well. Spoon the potatoes into the channel in the meat. 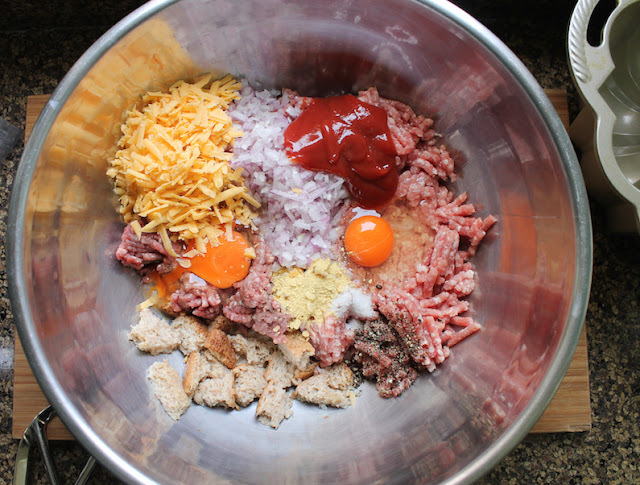 Top with the rest of the meat mixture and press it into the sides and middle. 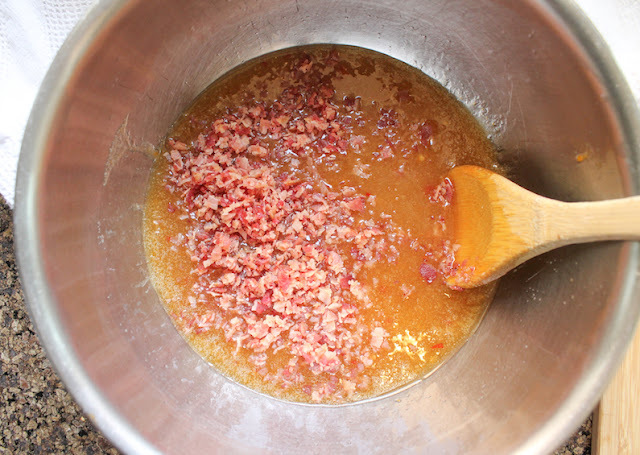 Fold the excess bacon over the top of the meat mixture from the sides and middle. 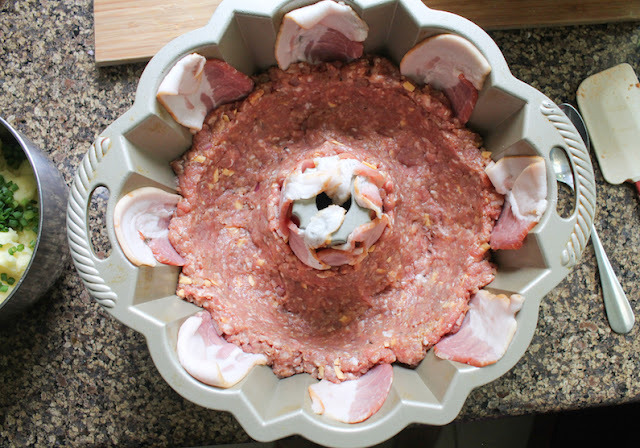 Bake in the preheated oven for 45 minutes or till the internal temperature of meatloaf reaches 160°F or 71°C. 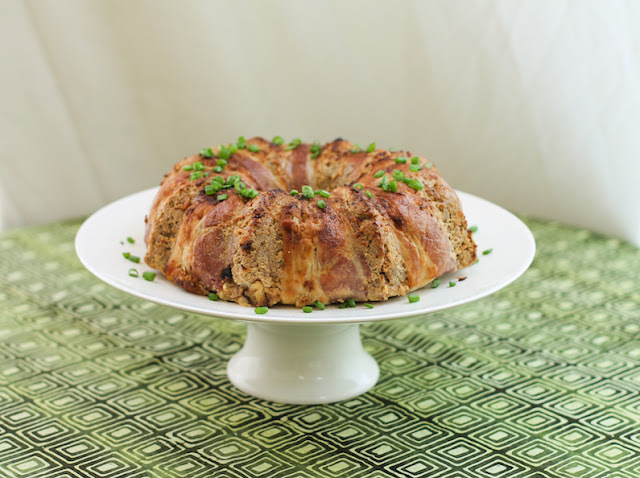 Cool the chive potato filled cheeseburger meatloaf Bundt for 15 minutes in the pan. 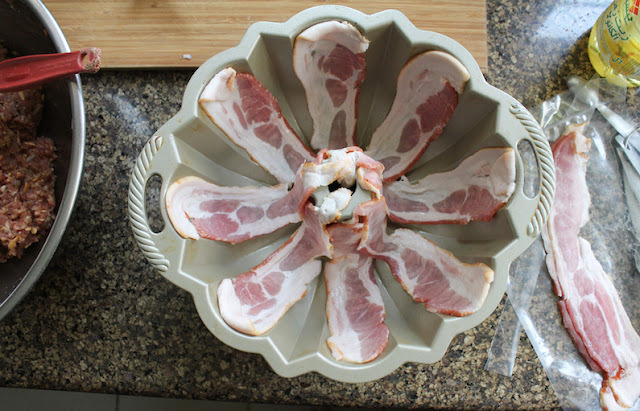 Carefully turn it out onto a baking pan. 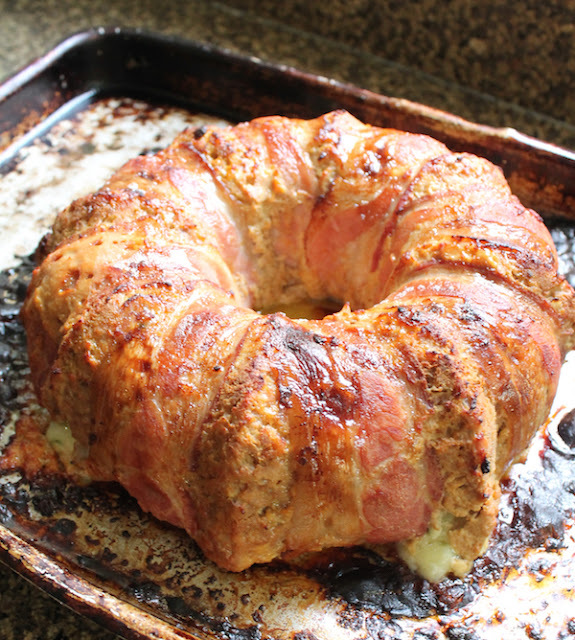 Raise the oven temperature to 400°F or 200°C and roast the meatloaf for 15 minutes more or until golden. I turned the top element of my oven on for the last five minutes, to heighten the color. You might want to do the same. Cool for 10 minutes before slicing. Serve with a side of lightly cooked green beans or perhaps a green salad. 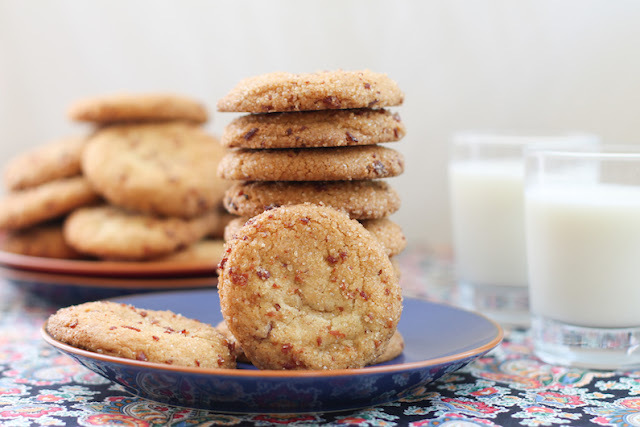 Soft on the inside and chewy on the outside, these chili maple bacon cookies are also the perfect combination of sweet, salty and spicy. 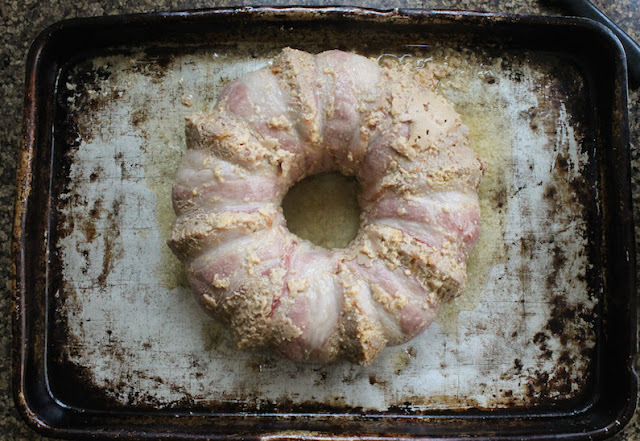 This is the cookie for your bacon-loving friend who doesn’t usually eat cookies. (Like me.) The subtle maple flavor and the fresh kick of chili from the spiked syrup balance the smokiness and salt of the bacon. But make no mistake, these are still plenty sweet enough to be called cookies. 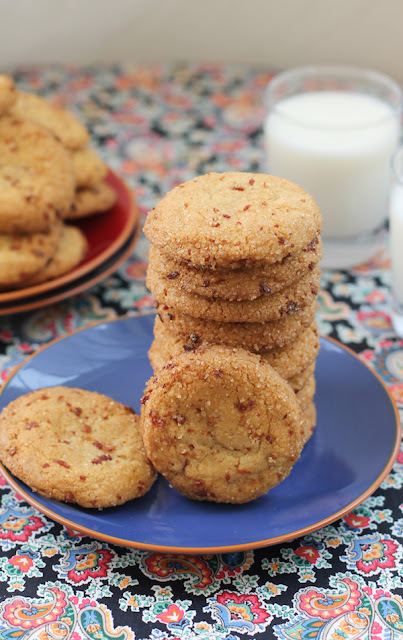 I’m not much of a cookie eater but these guys with bacon and chili have me hooked! 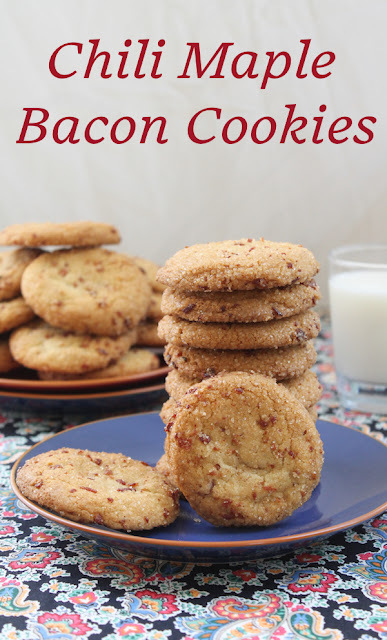 If you like cookies with bacon, you might also want to try my Brown Sugar Bacon Cookies or my Bacon Dark Chocolate Bourbon Cookies. Mince the chili pepper finely and put it in a microwavable measuring cup or bowl with the maple syrup. Warm the syrup (about 30 seconds should do) and then leave to cool so the chili pepper flavor and heat will infuse the syrup. Fry the bacon until crispy then drain on paper towels. Once cool, mince it finely. 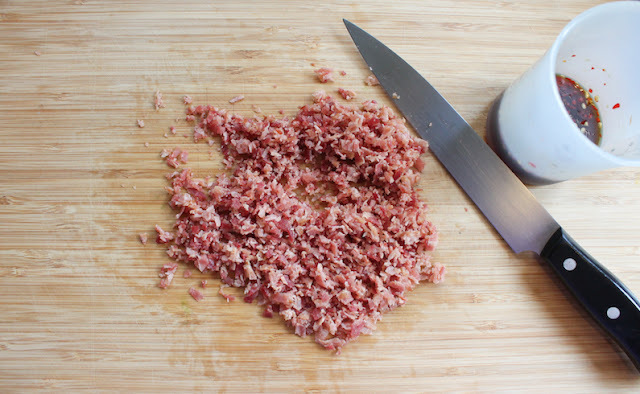 Divide the bacon bits into piles of about two-thirds and one-third. We’ll mix the bigger pile into the cookie dough and use the smaller one for rolling the dough balls. Note: Once the maple syrup is cool, you can strain out the chili pepper if you’d like. I like to leave mine in. 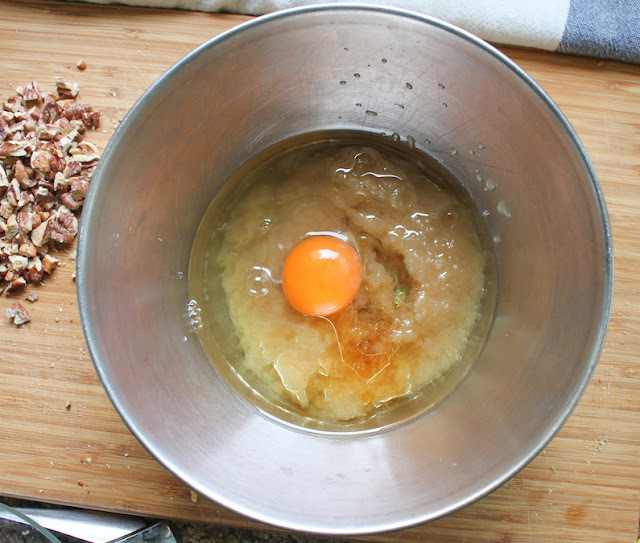 In a mixing bowl, stir together oil, sugar, egg, maple syrup, baking soda, salt and vanilla. 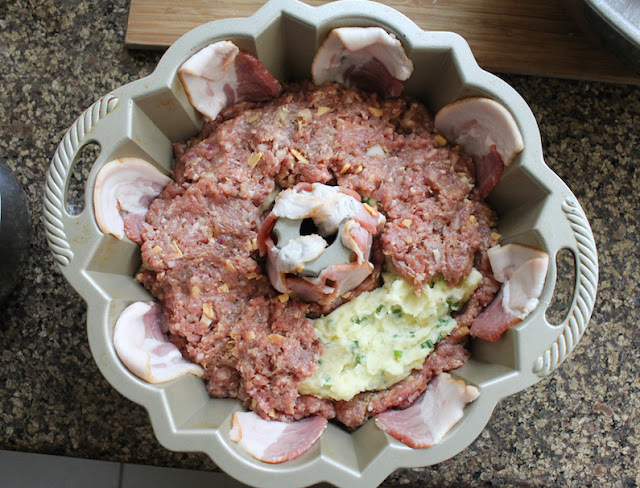 Add in the bigger pile of minced bacon. Mix well, then stir in the flour, stirring just until it is mixed in. Preheat the oven to 375°F or 190°C and line two or three cookie sheets with baking parchment or silicone liners. 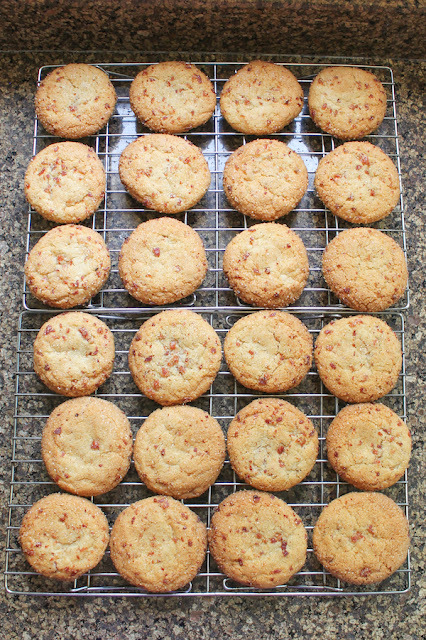 These cookies do spread out so I baked them only six at a time. 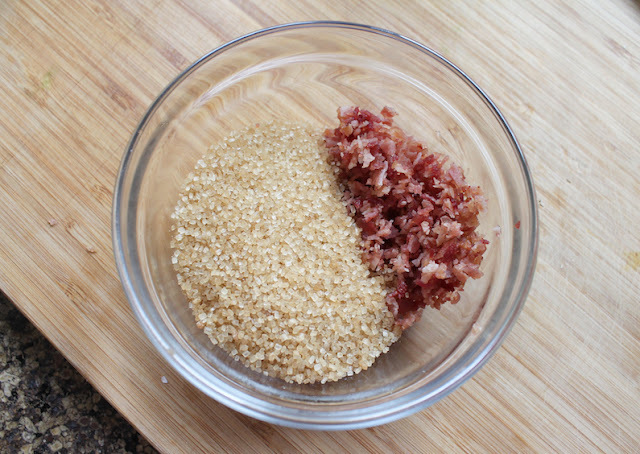 Mix the turbinado or demarara sugar with the reserved minced bacon in a bowl. Use a tablespoon or cookie scoop to divide the dough into 24 pieces. 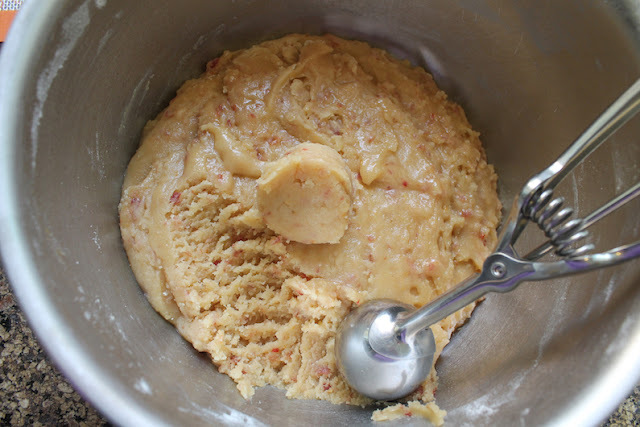 Roll the dough pieces into balls and then roll in the sugar and bacon. 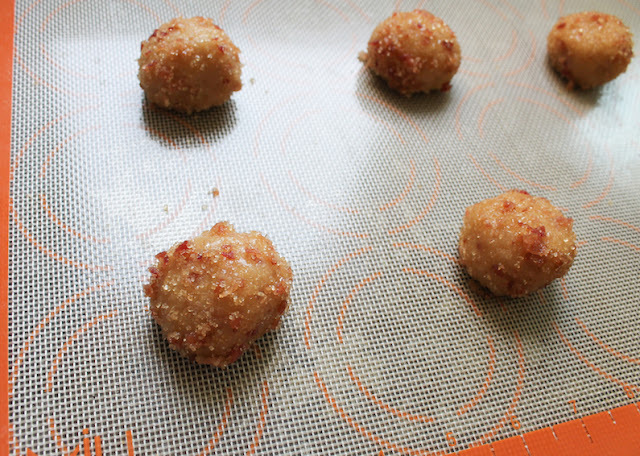 Place the balls on the prepared cookie sheets and bake in the preheated oven for 10-12 minutes. Cool on the cookie sheets then remove to a wire rack to cool completely. 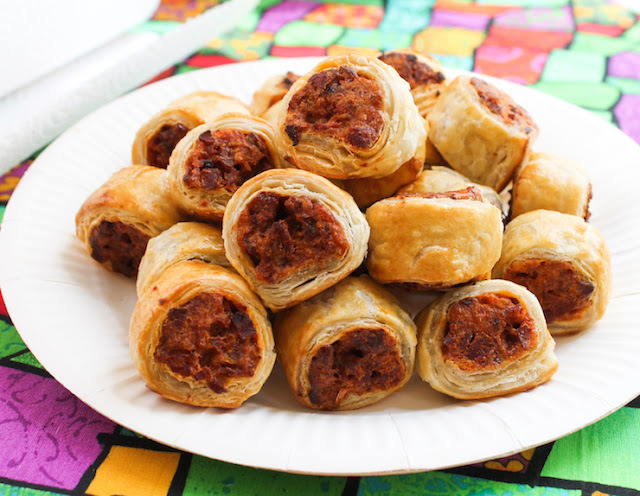 Take a traditional sausage roll into delicious Spanish territory with these patatas bravas chorizo sausage rolls. ¡Olé! They are perfect with a chilled glass of rosé or beer for your summer party or picnic. I love sausage rolls. In fact, they are one of my favorite snacks, whether made with puff pastry, short crust or yeast dough. And I don’t really mind which kind of sausage you put in the middle. Even a hot dog will do. Back when my girls were students at the International School of Kuala Lumpur and I was often on campus doing volunteer work, I would eat sausage rolls most every morning. 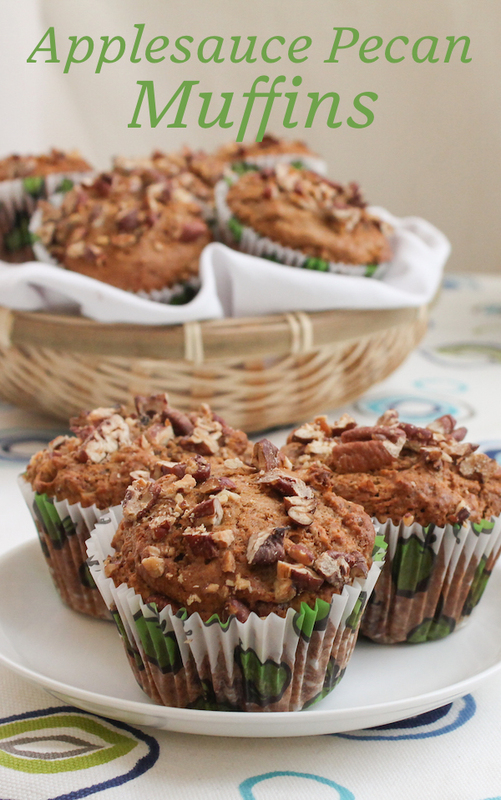 They were homemade - baked fresh each day - by the wonderful cooks who staffed the canteen. 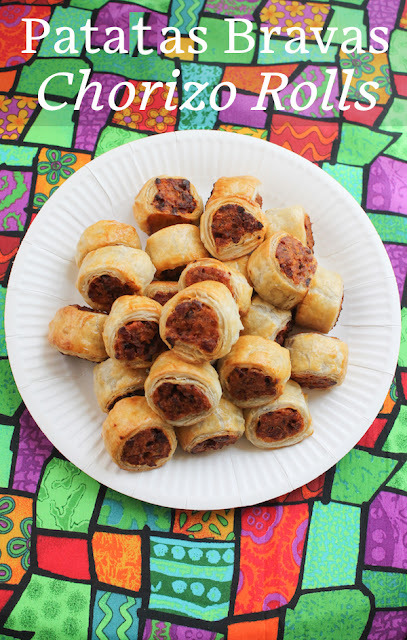 Best of all, sausage rolls are portable so they are great for an on-the-go snack or picnic. Serve them hot or room temperature. Either way, they are delicious. 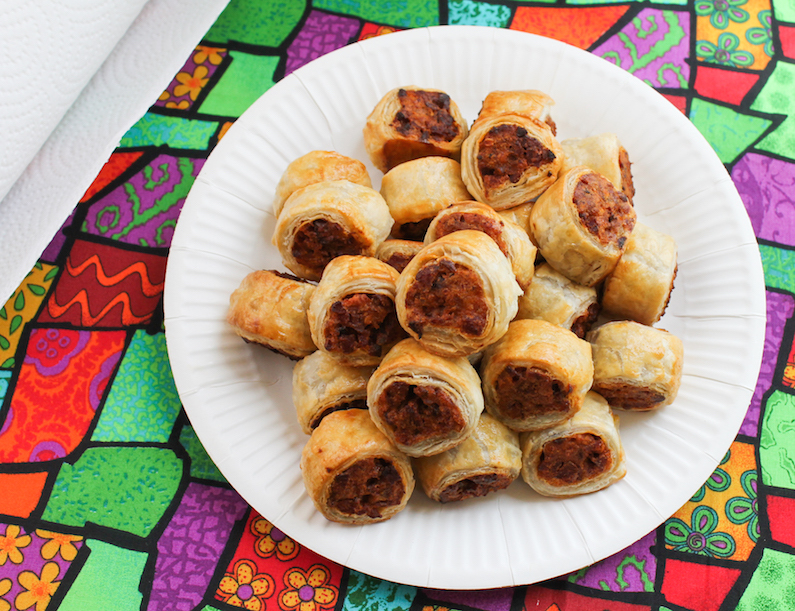 These patatas bravas chorizo sausage rolls are a spicy twist on my classic English sausage rolls. If Spanish folks made sausage rolls, this is how I imagine they’d turn out. Not that they do, as far as I know. 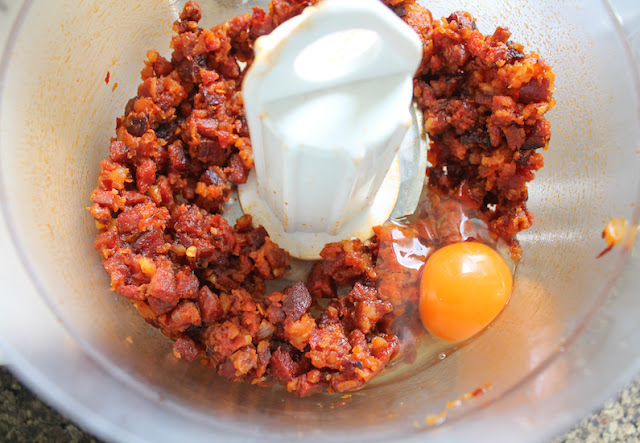 Remove the casing from the chorizo and chop it into small dice. 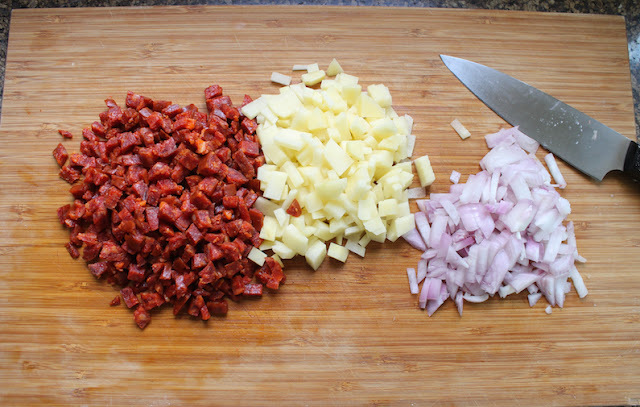 Cook the chorizo and the diced potatoes with a splash of water, covered, for about 5-7 minutes. 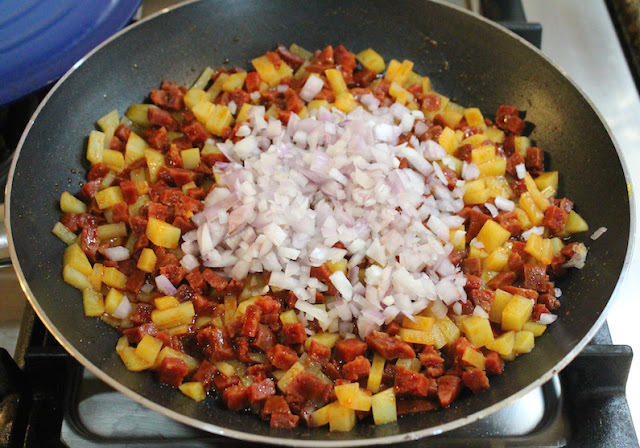 When the water has evaporated and the oil has been released from the chorizo, remove the cover and add the onion. Cook, with a splatter guard, over a medium high heat until the potatoes are browned and tender and the onions are soft. Add in the tomato paste, crushed pepper, paprika and sugar. Stir well and cook for another 2 minutes. 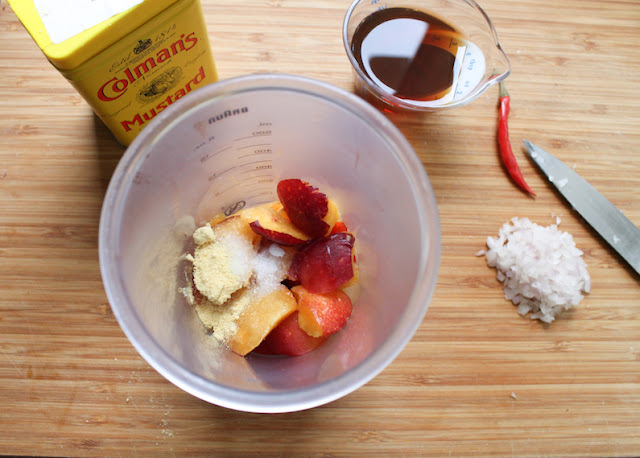 Leave the mixture to cool for a few minutes and then spoon it into a food processor. 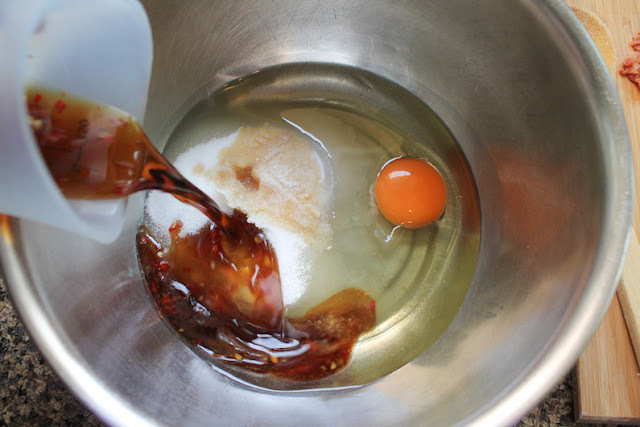 Process with 1 egg till you have a homogeneous mixture that still has small pieces. 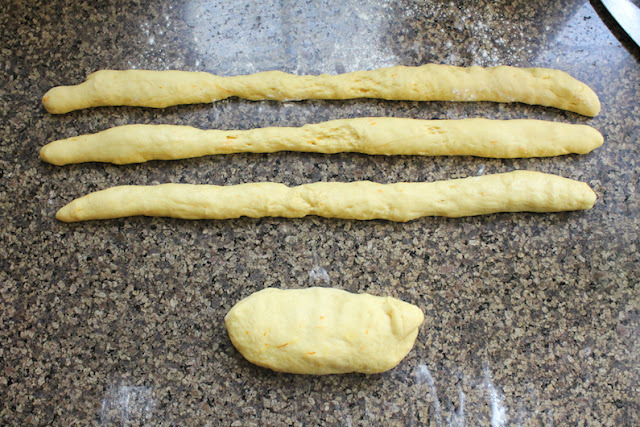 Roll the puff pastry into two long sheets on a lightly floured surface. Spoon the patatas brava chorizo filling onto the puff pastry. Roll it up almost all the way then brush the beaten egg on the last section to help seal the roll. Wrap the rolls up in cling film and chill for 15 minutes. Meanwhile, preheat your oven to 400°F or 200°C. 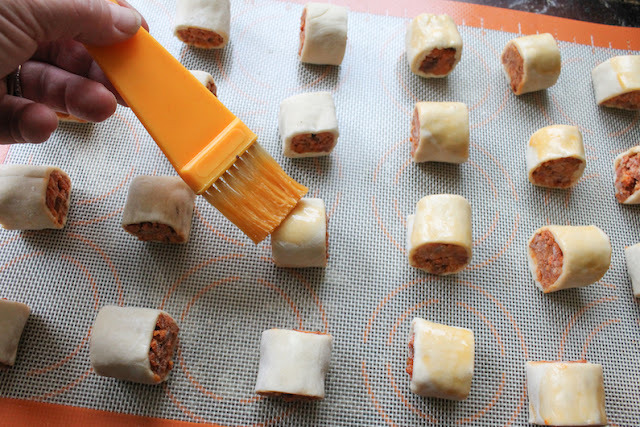 Use a serrated knife to cut the sausage rolls into bite-sized pieces. 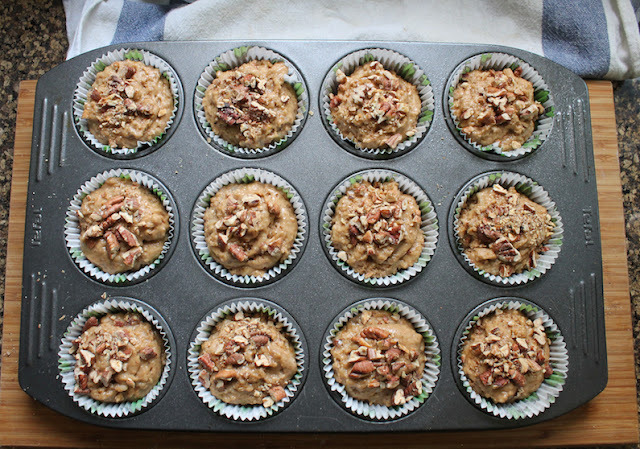 Set them on a baking sheet lined with baking parchment or a silicone liner. Brush them with the beaten egg. Bake in the preheated oven for 12-15 minutes or until the patatas brava chorizo sausage rolls are puffed and golden. Now pour yourself a glass of chilled rosé or beer and enjoy! 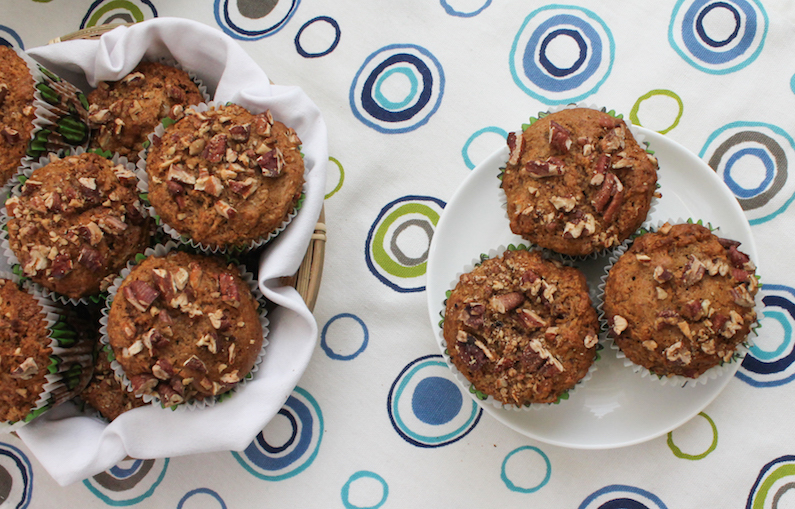 Are you a fan of picnics and picnic food? 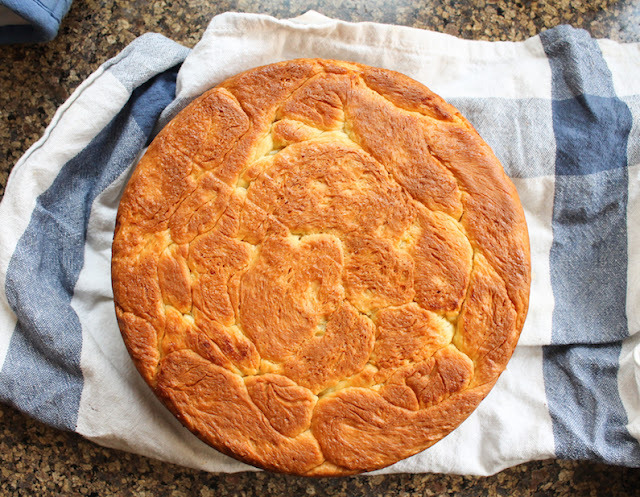 This week my Sunday Supper group is sharing our best recipes to take along on a picnic. Many thanks for our event manager Em, and our host this week, Christie of A Kitchen Hoor’s Adventures. Sweetened with honey, this orange saffron braided brioche is wonderful freshly baked or even toasted and buttered for breakfast, day after day. Not that it lasts very long! 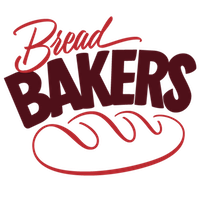 This month our Bread Bakers host is Gayathri from Gayathri's Cook Spot and she challenged us all to braid our dough before baking. I’ve made a few braided loaves, like my chocolate peanut butter braid and my cherry sweet bread twist, which are both long loaves. 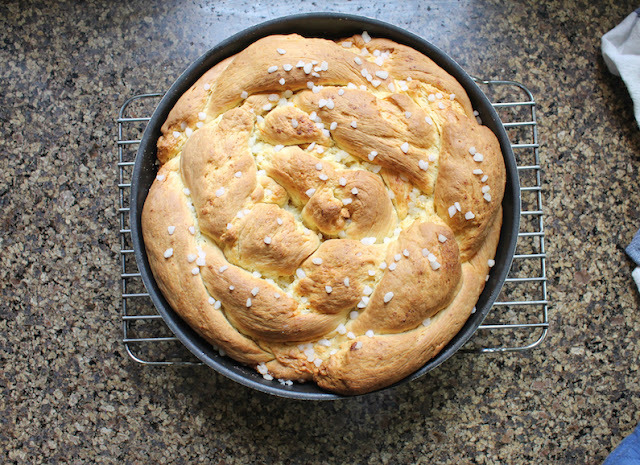 I decided I wanted to learn how to make a round woven loaf. A quick search of YouTube turned up hundreds of hits. (Is there anything the denizens of YouTube do not know how to do?!) I ended up following this one. Warm your milk in a small pot or in the microwave in a microwaveable measuring up. Put in the pinch of saffron and the orange zest and leave to infuse. Add in the butter and honey and warm again until the butter is melting. Around 120°F or 49°C should do it. Sprinkle in the yeast and stir. Within a few minutes, the yeast should activate and begin to bubble up. 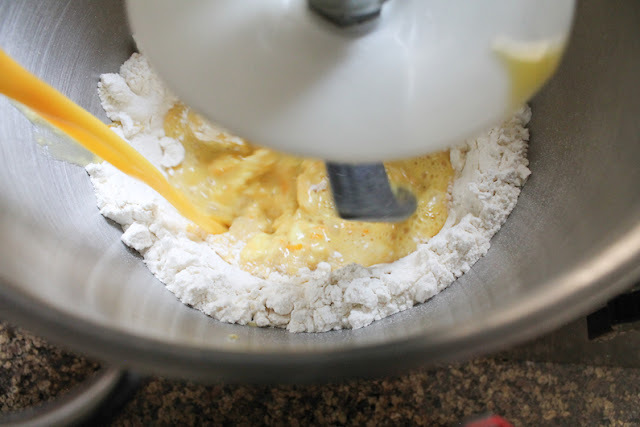 Put your flour and salt in the mixing bowl of your stand mixer with the egg and begin to mix, using the dough hook. 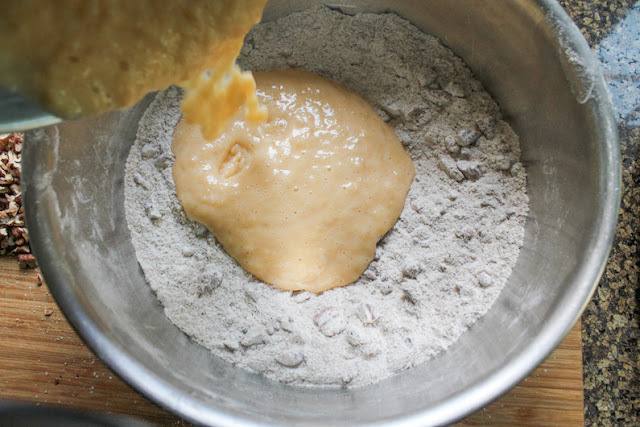 Pour in the yeast mixture and continue mixing till it comes together in a thick dough. 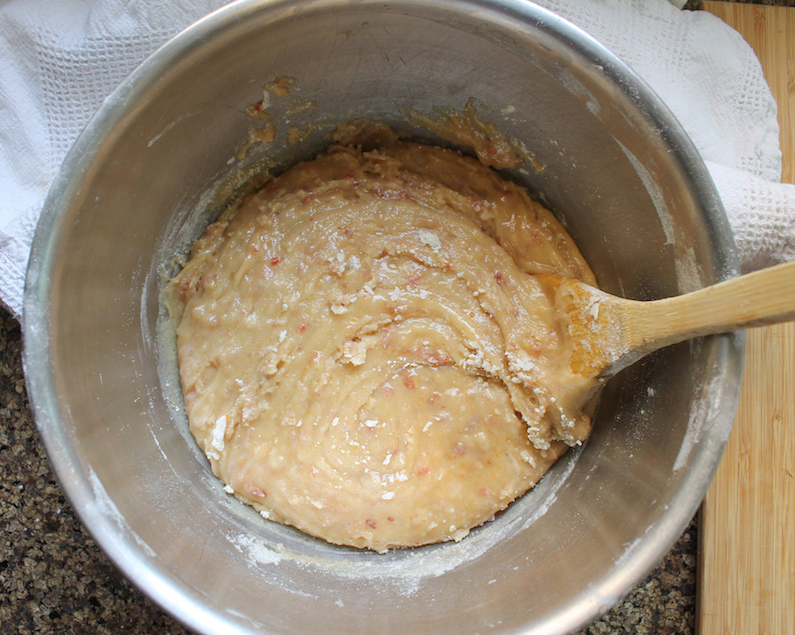 Knead for several minutes until the dough is smooth and stretchy and pulls away from the sides of the mixer. 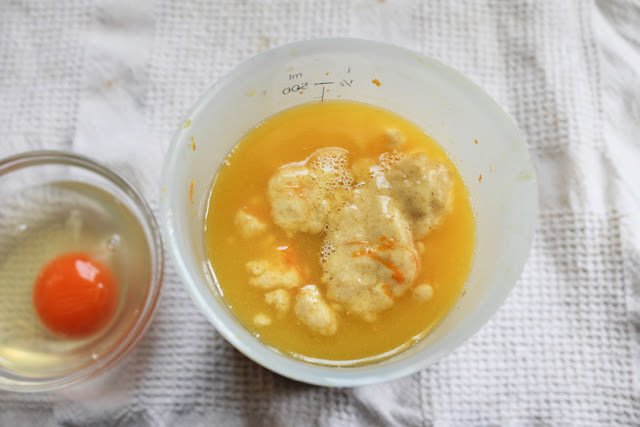 Form the dough into a ball and lightly grease the bowl with a little butter. Put the ball back in the bowl. Cover with cling film and set in a warm place to rise for one hour. 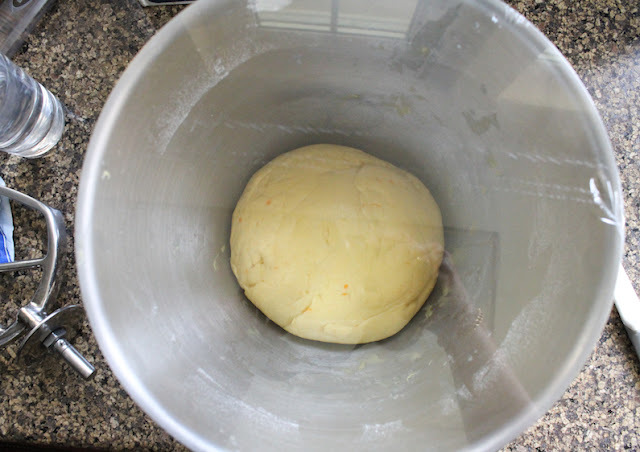 Once the dough has risen, punch it down and separate it into four equal pieces. Roll each piece into a long tube. I took photos of each step of making these four tubes into a round braided loaf but honestly, stationary images are not that helpful because, at least for me, it’s hard to see what moves from frame to frame. So just watch this YouTube video. She makes it look very easy – and it is! 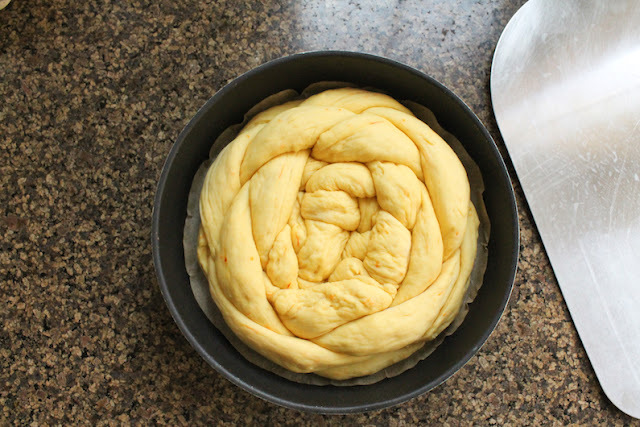 Put your round braid into a round cake pan, cover lightly with cling film and set in a warm place to rise for about an hour. As you get to the end of the rising time, preheat your oven to 350°F or 180°C. 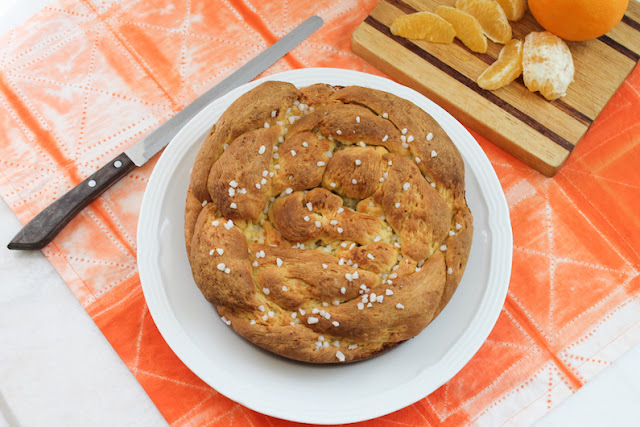 When rising time is up, gently pour the melted butter over the top of the orange saffron braided brioche and sprinkle on the pearl sugar, if desired. Bake in your preheated oven for about 35-40 minutes. 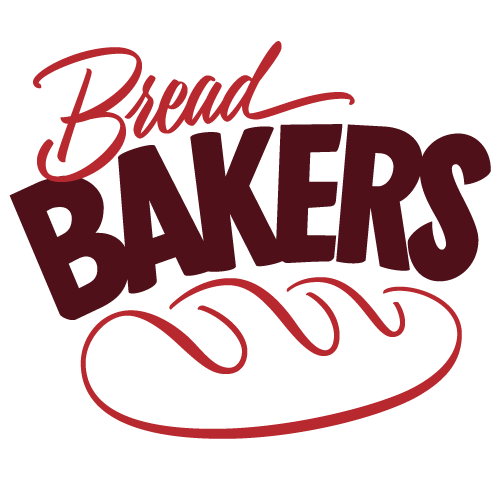 The internal temperature of an enriched bread is usually about 200°F or 93°C when baked. The bottom should be lovely and golden as well. 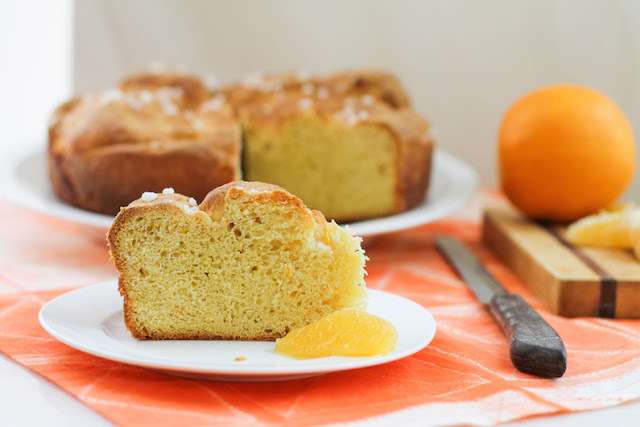 Leave to cool before slicing and serving. 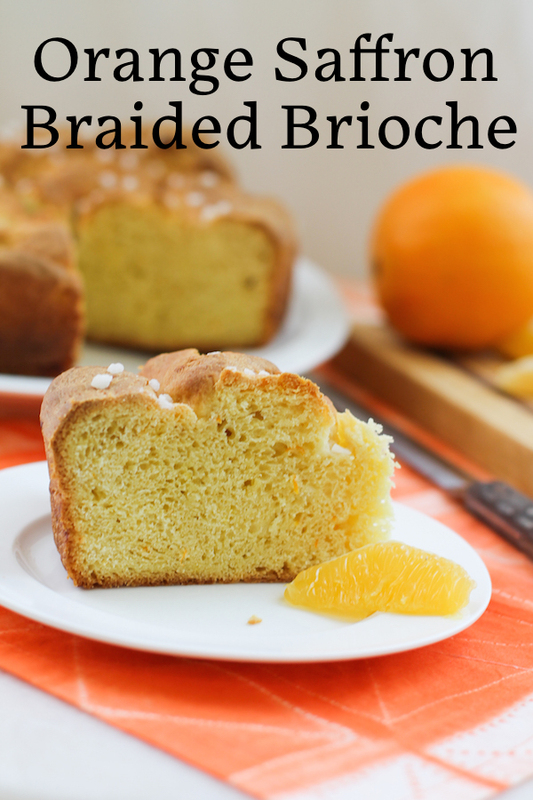 Check out all the other lovely braided breads we have for you today. Many thanks to Gayathri of Gayathri's Cook Spot for hosting!